Posted March 5, 2014 by Omi Prive & filed under Award Winning, Custom Collection, News, Omi Privé, One-of-a-Kind Collection, Pink Sapphire, Sapphire. Omi Privé has been recognized by jewelry industry for the third year in a row! The second sapphire ring won first place in the “Bridal Jewelry over $10,000” category. A stunning 3.50 carat radiant-cut sapphire is framed perfectly by a double border of round sapphires and brilliant diamond rounds. Handcrafted in platinum, the hidden beauty of this piece lies underneath, where two inner baskets of hand-set French pavé diamonds and blue sapphires cross to form its base. “We are honored to have won this year, and we thank all of the jewelry retailers who voted for Omi Privé. Our continued determination is to bring the stones to life through the jewelry in which they are presented,” concludes Nagpal. View all of our award winning designs. Posted February 14, 2014 by Omi Prive & filed under Custom Collection, News, Omi Privé, Pink Sapphire, Ruby. Sign up to receive all of our e-news at the bottom of the page! Posted February 5, 2014 by Omi Prive & filed under Alexandrite, Award Winning, Custom Collection, Emerald, Omi Privé, One-of-a-Kind Collection, Pink Sapphire, Ruby, Sapphire, Signature Collection, Topaz, Trends. Succeeding the official launch of Omi Privé’s new web site, and attending the AGTA GemFair in Tucson, has deduced a central fact: this is the year for COLOR. 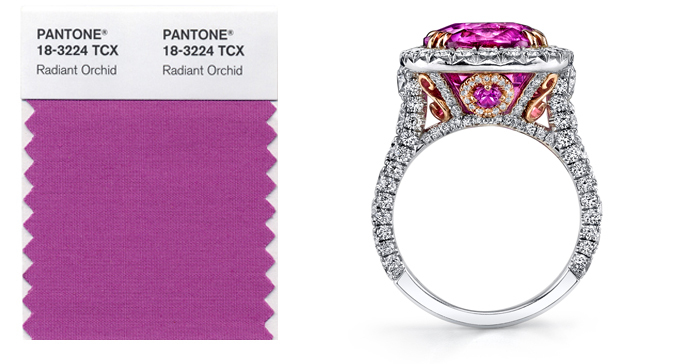 From in-demand pinks to alluring double halo designs, below are the top 10 Privé pieces noticed, desired, and adored into 2014. 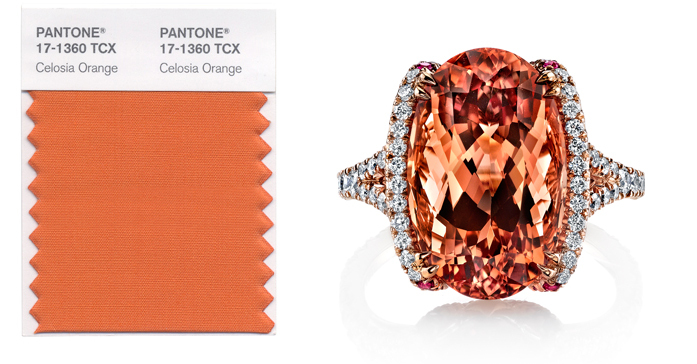 Omi Privé Cheers for Pantone’s 2014 Spring Colors! Posted September 10, 2013 by Omi Prive & filed under Custom Collection, Omi Privé, One-of-a-Kind Collection, Pink Sapphire, Sapphire, Topaz, Tourmaline, Yellow Sapphire. Perfectly aligned with New York Fashion Week, Pantone has released their Spring 2014 Color Report, revealing soft pastels paired with vivid brights for a colorful equilibrium. Inspired by a mixture of blooming flowers, travels abroad, and strong, confident women, designers are using color to refresh, revive and defy conventional wisdom. Omi Privé is excited to introduce some of 2014’s colors in our latest designs. Let us know which color is your favorite! You can even take the 2014 Color Survey here and see which color has the lead! Cayenne, a high-pitched reddish orange, adds a dash of spicy heat to neutrals. 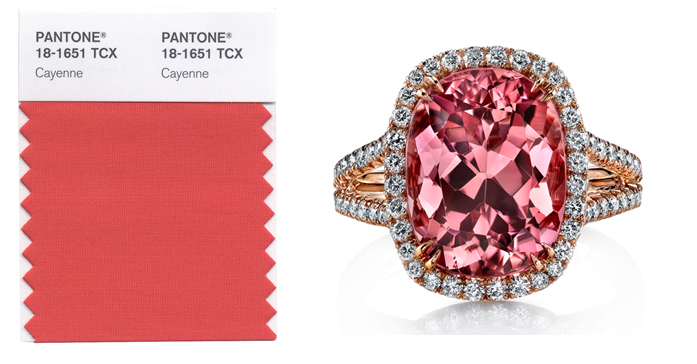 Our 18K rose gold and pink tourmaline ring exudes “Cayenne”! Radiant Orchid is a perfect companion to pastels and pairs well mixed with other bold colors. Pink sapphire comes in a variety of hues, including “Radiant Orchid” as seen in this one-of-a-kind pink sapphire platinum and 18K rose gold ring. Placid Blue, induces a sense of calmness and tranquility as seen in our double-halo sapphire and platinum engagement ring. 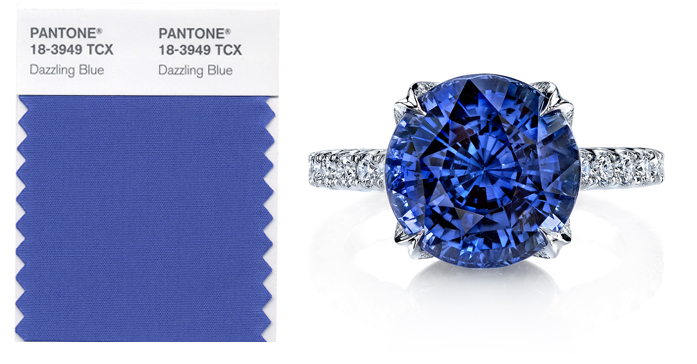 With its clean and clear-blue, cornflower blue sapphire will make its wearer feel the breeze and brilliant shine of calm seas. 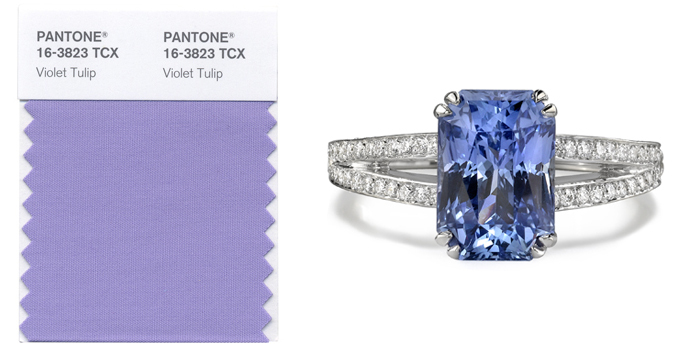 Dazzling Blue, a scintillating, polar opposite to Placid Blue, this strong color as seen in our violet-blue round sapphire and diamond ring pairs well across the pallet. Freesia, an intense yellow, brings powerful energy to the spectrum. 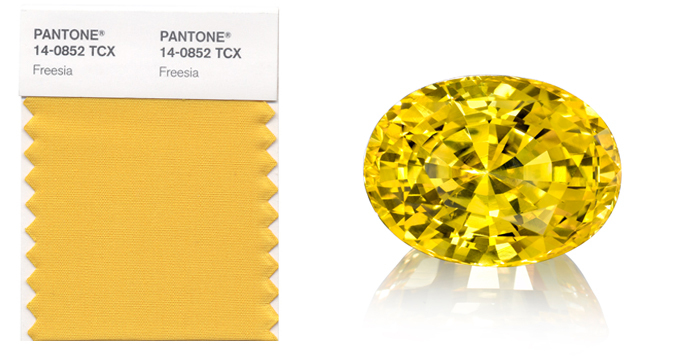 Yellow sapphires are the perfect gemstone to elude this sunny hue. Violet Tulip, a romantic, vintage purple, evokes wistful nostalgia. 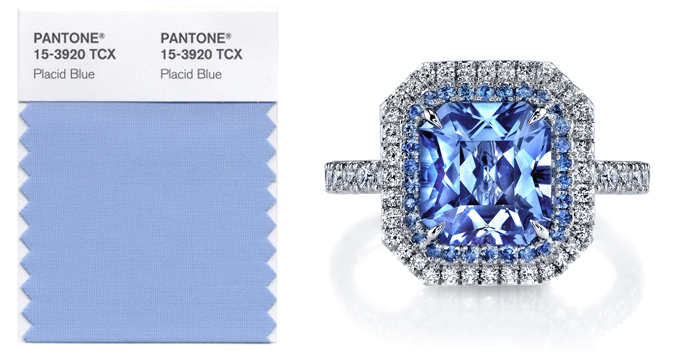 What does our radiant-cut fancy sapphire ring bring out in you? Hemlock, a summery, ornamental green, provides a touch that’s different from the Emerald green of last year. 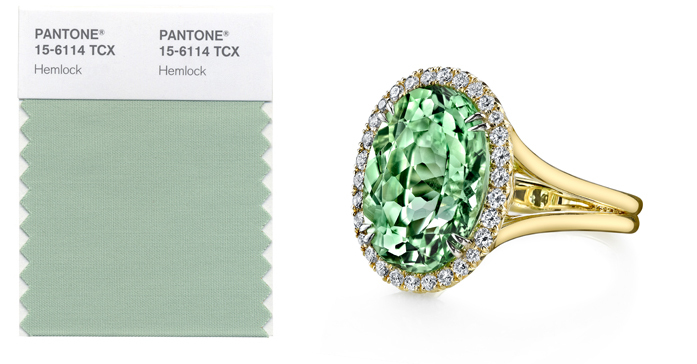 Green tourmaline paired with yellow gold is the perfect hue to carry summer through every season! Celosia Orange, an optimistic, spontaneous hue can inspire you every day with our imperial topaz, ruby and diamond ring set in 18K rose gold.